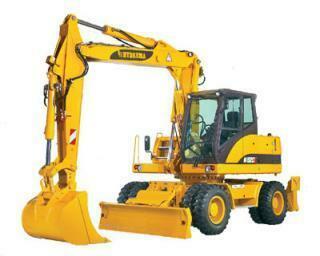 Hydrema is the manufacturer of the wheel excavator model M 1520 B3. Find and download detailed specs and data sheets for this machine here. This wheel excavator is built to provide up to 91kW or 122 horse power, delivered from its powerful Perkins engine to the 16.9t M 1520 B3 machine. The M 1520 B3 is categorised in the medium sized machine segment in the wheel excavators category. The bucket capacity of M 1520 B3 is 0,8m³, which is above average for this type of machine. The Hydrema M 1520 B3 has been equipped and sold with Overload alert and Blade. It has been sold without air Track guidance, Diesel particulate filter and Quick hitch hydr. As of 2004. There are more detailed specifications and machine descriptions available in the original Hydrema M 1520 B3 specs data sheet. This model can be acquired for a list price between €136000 and €173000. Production of the M 1520 B3 stopped in 2004. For more detailed information about pricing and current residual values, check out the LECTURA Valuation system. The most commonly viewed Hydrema models of this type on LECTURA Specs are the MX 18, MX 16 and MX 14, and 3 other wheel excavators, which currently range from 15.3t up to 19.3t are also available. Want more detailed specifications? Download the latest Hydrema M 1520 B3 specs data sheet on LECTURA Specs today!